Mr. Jagjeet Kapoor, known as “Jag” to most people, immigrated to the United States in 1977, where he embarked on learning the grocery industry and progressed to one of the top Silicon Valley business entrepreneurs in the hospitality, retail, and real estate development industries. 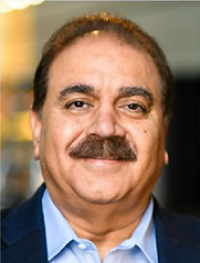 Mr. Kapoor is president of Stop ‘N’ Save, Inc. and Bonfare Market, which are both in the franchise business. He has proven success in the hospitality industry, including restaurants such as Unamas, Mexicali Grill, Pedro’s, and Saison – which received a 3-star Michelin rating and was ranked on The World’s 50 Best Restaurants list. Being in the heart of Silicon Valley, he dabbles in investing in start-up technology businesses such as Cognilytics, Zygox, XProtean, and most recently Tekion. Among his other accomplishments, Mr. Kapoor is married, father of two children, and a licensed pilot. He also enjoys golf. He is currently the chairman of Bonfare Markets Charitable Foundation and a member of TIE (charter member), APCA, AOPA, and NACS.